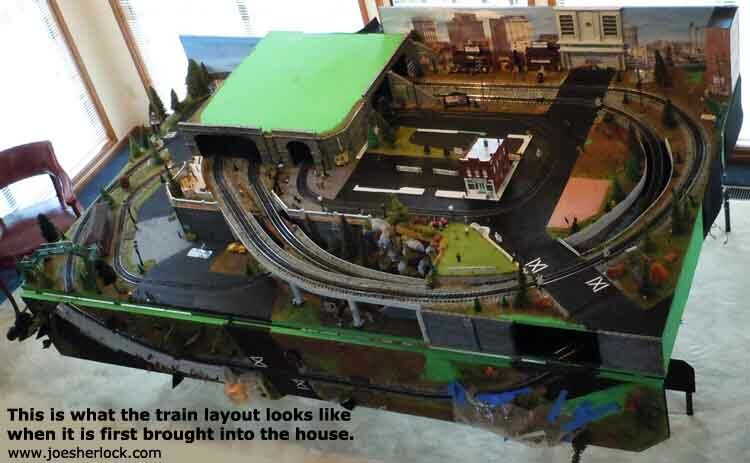 The O-scale train layout is designed to be stored most of the year. It is, typically, set up from mid-November to mid-February. 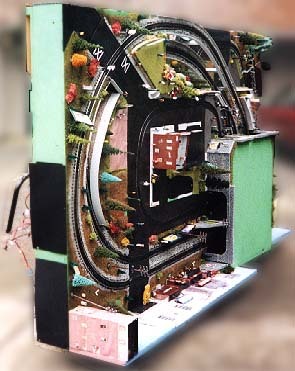 The above photo shows the finished train layout without the black skirt. The underside, legs and rockers are visible. 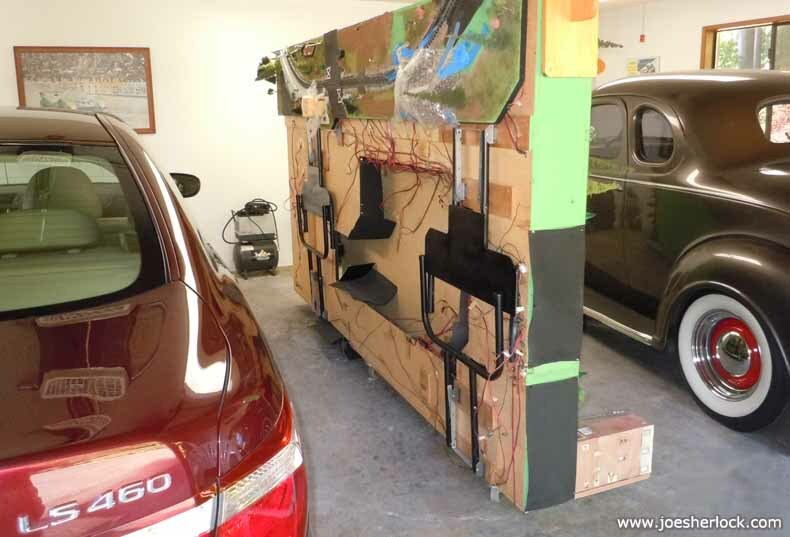 All wiring is secured to plywood with clear packing tape. Wiring is connected via bus bars and quick disconnects. • The mountain is removable and stores separately. It consists of 3 pieces - a center piece with the track mounted to a thin wood frame and two lightweight foam side pieces. • All of the lower level tunnel entrances detach for storage. They are made of lightweight foam. • The plywood extension supporting the Lionel Hobby Shop detaches for separate storage. It is secured to the structure with two bolts with wing nuts. 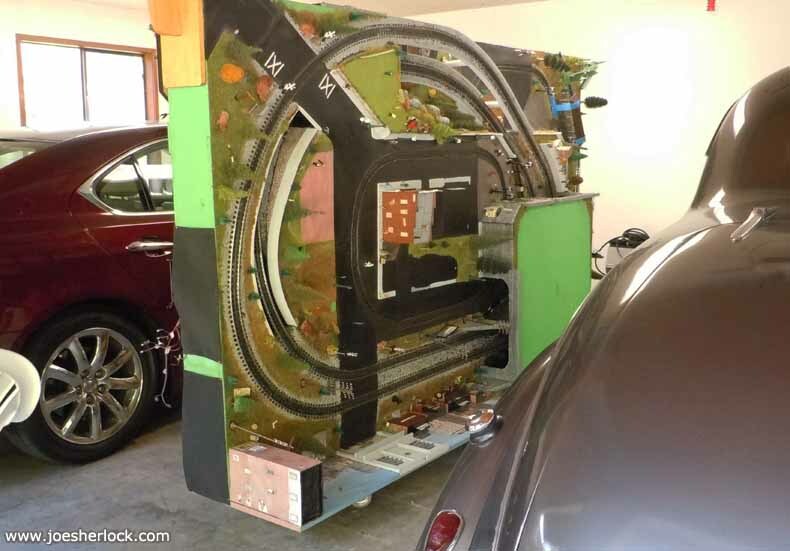 • The 13-inch high backdrop at the rear of the layout has six caster wheels mounted on the back. When the unit is rotated 90 degrees, these casters allow for easy movement of the structure as it is rolled to-and-from the storage area. • The structure has reinforced metal folding legs for compact storage. The drop leaf-section has wooden folding legs. • The layout is quite heavy - requiring too much muscle to lift and rotate the platform 90 degrees. To ease the 'grunt' needed to rotate the unit, I designed and had fabricated two rockers made of 1/4-inch thick steel plate stock. After the layout is rolled into the house and into position (we use plywood ramps to traverse the front step and doorway sill plate), the rockers are attached to the layout with screws. Then a wood cross-beam is bolted to the steel rockers, forming a cradle. Rocker cradle assembly - two black rockers, fabricated from 1/4-inch steel plate stock, connected by a wood cross brace - permit the train layout to be rotated from vertical position to horizontal operating position. These photos show layout in its horizontal, operating position. 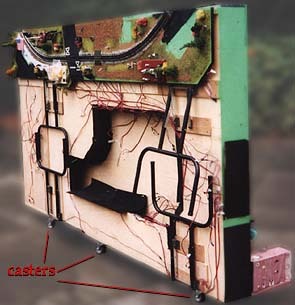 The caster wheels are at the rear of the layout on the back side. The rockers are also attached to the platform itself. Once the layout is rotated to vertical, the rockers are removed so that the unit will fit through doorways and can be easily stored. In order to prevent marking/staining of the carpet in the living room, the surface of the rockers is covered with a layer of clear polyester tape. The train platform - covered with a white tarp to minimize dust - is stored in my garage between two cars. 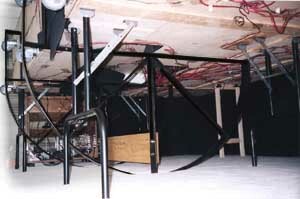 It is secured with a wood brace which is anchored to the garage ceiling, to keep the platform from tipping over. The caster wheels are secured with wedges.